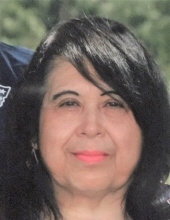 Mrs. Anna Belia Martinez, longtime resident of Hereford, passed away August 3rd, 2018 at the age of 65. Mrs. Martinez was born in O’Donnell, Texas to Raul Murillo and Francisca Reyes on August 7, 1952. The family moved to Hereford in 1966. She was a high school graduate and met her lifelong soul mate Crispin Martinez in 1978. Anna and Crispen renewed their marriage vows at San Jose Church in 1995. Anna worked as a cashier at Baker’s Grocery and at Goodwill. She also worked as a receptionist at the Hereford Health and Human Services department of the City of Hereford. She became a full-time homemaker once her children were born. In her spare time, she collected earrings and loved to shop at garage sales and thrift shops for collectibles, especially Coca Cola memorabilia. She also enjoyed attending family gatherings and eating out at her favorite restaurant, La Frontera. She was an avid reader of cookbooks and family members fondly recall long conversations with her. Mrs. Martinez is preceded in death by her parents, her three brothers Roy, Robert, and Sammy Murillo, her son Johnny J. Martinez, and by her great-grandson Juan Jose Martinez III. She is survived by her husband Crispin Martinez, her brother Art Murillo and wife Jennifer Palomino of Amarillo, Texas, brother Jessie Murillo and wife Delilah of Hereford, Texas, and sisters Adelina and husband Baldomero Campos of Hereford, Texas, and Daisy Cortez and husband Luis Perez of Abilene, Texas. She also leaves behind her children and grandchildren: daughter Alice Martinez Gonzales and husband Philip Gonzales and their children Felicia A. Martinez and fiancé Justin Pierson, Micah, and Alesha Gonzales of Hereford, Texas, and Philip Ray of Austin, Texas, son Chris L. Martinez and wife Jessica Martinez of Amarillo, Texas and their children Christopher Jr. Martinez of Clayton, New Mexico, Dominick Martinez of Amarillo, Texas, Mariah Martinez of Abilene, Texas, and Jasmine Martinez of Abilene, Texas, son Michael Martinez and wife Elena Landeros and their children Araceli and Carmen Landeros all of Abilene, Texas, son Johnathan Martinez and special grand-dogs Sunni and Bambi all of Dallas, Texas, and daughter-in-law Priscilla (surviving Johnny J. Martinez) of Amarillo and their sons J.J., Paul, Joseph, and Christian Martinez all of Amarillo, and Johnny J.’s son Kylub Martinez of Hereford, Texas. She is also survived by great grandchildren Anaya Faith and A.J. Leos of Childress, Texas. Mrs. Martinez leaves behind numerous nieces, nephews, and friends, all of whom love and will miss her greatly. The family requests that memorial donations be made to the American Diabetes Association to support Diabetes Research. Fr. Father Jose Ramon Molina will be the celebrant. Burial to follow at St. Anthony's Catholic Cemetery. "Email Address" would like to share the life celebration of Anna Belia Martinez. Click on the "link" to go to share a favorite memory or leave a condolence message for the family.